Order your right now for only $9.95 plus $3.00 shipping and handling! You will also get access to my 3 part video on Attracting Money Now! ...And a DVD copy of the hit movie The Secret! 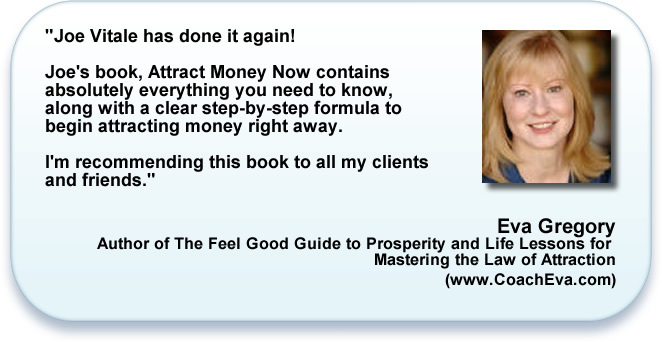 The Attract Money Now hard cover version reveals an easy, proven, 7-step formula you can use today to begin attracting money, getting out of debt, and ending the struggle once and for all. 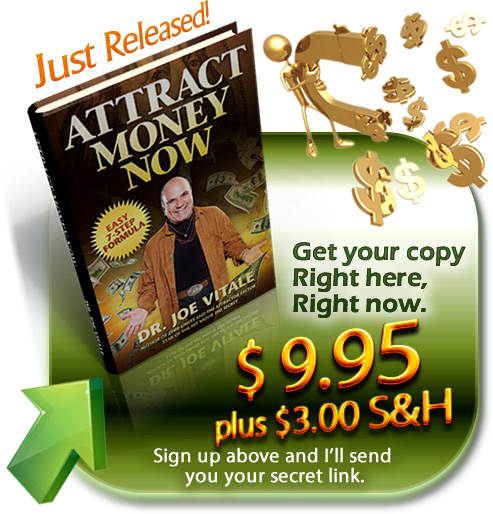 In the pages of this fast-reading, inspiring new book, Dr. Joe Vitale -- bestselling author and star of the hit movie The Secret -- walks you through his easy system for attracting money using the Law of Attraction and Law of Right Action. 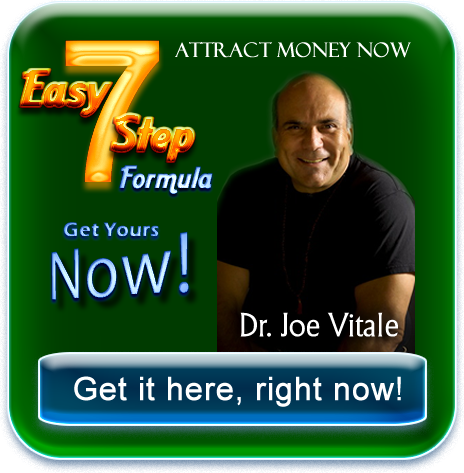 In Attract Money Now, you’ll learn… The Proven 7-step formula to attract money FAST that will work for YOU. AND 29 ways to Attract Money NOW! This exclusive 7-step formula took Dr. Vitale more than 20 years to perfect. It’s the same foolproof system that helped Joe go from homeless on the lonely streets of Dallas, to a bestselling author and financially free multimillionaire in just a short time. Dr. Vitale's system has nothing to do with real estate, investing, or saving for a rainy day. Instead, Attract Money Now reveals a spiritual and practical way to erase limiting beliefs, do what you love, and get into the cash flow that makes life easy and luxurious for all. You'll love reading this refreshing book that frees you to have the life you want -- for yourself, your family, and the world. Order Today and Start Attracting Money Now! Check out what these amazing folks have to say about Attract Money Now. 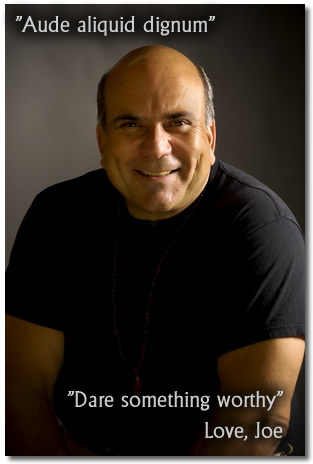 Meet Dr. Joe Vitale Bestselling Author Joe Vitale, is known as The World’s Only “Spiritual” Marketer. Combining his unique, one-of-a-kind charismatic/inspirational style, and exclusive five-step “attraction” system, Joe has successfully coached thousands of people, through his seminars, books, DVDs, webinars, and TV/radio appearances, on the “law of attraction.” Thousands of testimonials from all over the world prove Joe’s 5-step method for attracting wealth, health, love, and happiness work. 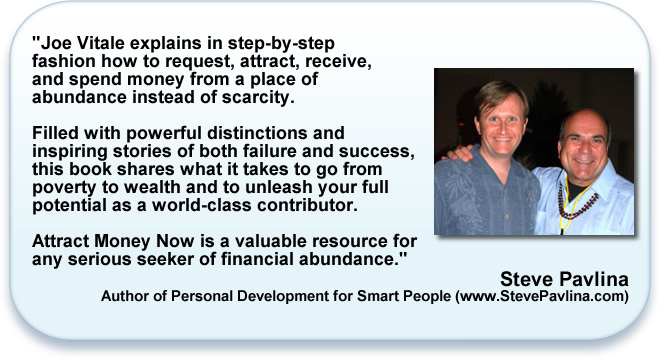 His system has helped countless people become millionaires and find happiness. 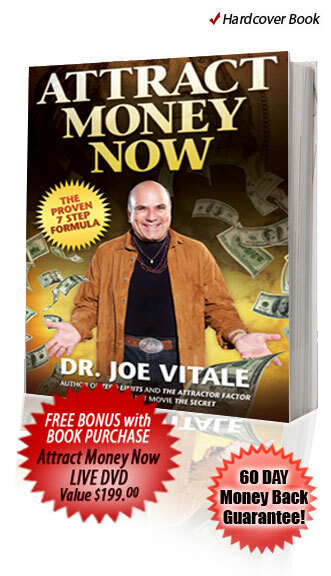 Joe’s system is so effective, he was asked to co-star in the world-famous movie “The Secret,” as well as contribute to the book. Joe Vitale developed his 5-step system when he went from literally being homeless, living on the streets of Houston, to becoming one the most prolific writers and entrepreneurs. Now he is financially independent living the life most only dream about. His life’s mission is to help others to do the same. Joe Vitale is a much sought-after public speaker, speaking to thousands of people annually at prestigious events including the Learning Annex expo and the National Speaker’s Association among other large-scale events. He’s also one of the most sought-after media interviews. His most recent interviews include, Larry King Live, The Big Idea With Donny Deutsch, Extra TV, and Newsweek magazine. Joe Vitale is also a passionate philanthropist and humanitarian, working with many private and public organizations. Joe also is the founder of the “Miracles Coaching” program. This is the only program dedicated to teaching thousands of people, through one-on-one coaching, how to use the Law of Attraction to create miracles in their lives.